Papa Francisco líderes con valor, compasión y convicción Papa Francisco ha captado la atención de los medios de comunicación y de católicos en todo el mundo con su enfoque aparentemente contrario a la intuición de liderazgo. En "Papa Francisco: por qué conduce la manera él dirige," superventas seminarista jesuita autor y ex Chris Lowney ofrece una mirada en profundidad en cómo los jesuitas del Papa Francisco formación directamente afectados los múltiples roles de liderazgo ha tenido--como sacerdote, obispo, cardenal, y ahora el Papa--y lo que sus pasadas acciones de liderazgo pueden decirnos sobre cómo él es probable que conduzca en el futuro. 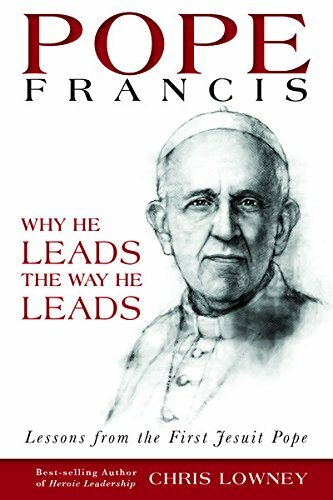 "For people of faith or no faith, Chris Lowney's "Pope Francis: Why He Leads the Way He Leads" is a timely introduction to the mind and heart of a pope who has defied expectations and charmed the world. In a culture that has become skeptical of institutional leadership, Lowney offers hope and insight into what an inspiring leader can look like. Drawing on themes from Pope Francis' (and his own) formation as a Jesuit, Lowney's accessible book invites each of us to reflect on our own obstacles to successful leadership. This book is perfect for anyone interested in better serving their families, schools, businesses, and organizations." "Tapping into his own fascinating and unique background, Chris Lowney has written an important, powerful book that is full of paradox. It is both deeply philosophical and immensely practical. It is suited for those steeped in Catholic faith and those with no faith formation at all. It is timeless and completely relevant for our modern age. Whether you are fascinated by Pope Francis or in search of useful tools for transforming the organization you lead, this book is a prize." "In our interconnected world where so many complain about a crisis of leadership, Chris Lowney presents the case of Pope Francis, a leader focused not on status but on mission. This is a powerful book for leaders of all stripes, religious and non-believers alike, who recognize the need to cultivate character and the ability to hold competing values as we navigate change, whether in business, organizations or society itself. I highly recommend it." "Lowney uses the life of Pope Francis to show us that the path to effective leadership begins in "leadership of self" and that the journey never ends. His books form a collection that should be the foundation of any business leader's personal library." "For people of faith or no faith, Chris Lowney's Pope Francis: Why He Leads the Way He Leads is a timely introduction to the mind and heart of a pope who has defied expectations and charmed the world. In a culture that has become skeptical of institutional leadership, Lowney offers hope and insight into what an inspiring leader can look like. Drawing on themes from Pope Francis' (and his own) formation as a Jesuit, Lowney's accessible book invites each of us to reflect on our own obstacles to successful leadership. This book is perfect for anyone interested in better serving their families, schools, businesses, and organizations." From choosing to live in a simple apartment instead of the papal palace to washing the feet of men and women in a youth detention center, Pope Francis’s actions contradict behaviors expected of a modern leader. Chris Lowney, a former Jesuit seminarian turned Managing Director for JP Morgan & Co., shows how the pope’s words and deeds reveal spiritual principles that have prepared him to lead the Church and influence our world—a rapidly-changing world that requires leaders who value the human need for love, inspiration, and meaning. Drawing on interviews with people who knew him as Father Jorge Bergoglio, SJ, Lowney challenges assumptions about what it takes to be a great leader. In so doing, he reveals the “other-centered” leadership style of a man whose passion is to be with people rather than set apart. Lowney offers a stirring vision of leadership to which we can all aspire in our communities, churches, companies, and families.